How to Transfer iTunes DRM M4V Movies to HTC One Max for Playing? Tutorials on how to convert 1080p iTunes drm-ed videos to HTC Smartphone, HTC One Max . Manufacturers like Samsung, Sony and LG have amply demonstrated that it's possible to build a pocketable, phone-like device with a screen bigger than five inches. Now it's HTC's turn. HTC One Max will be launched two days later, one Nov 15th. Then you will see a Smartphone with 1080p panel that measures 5.9 inches diagonally. It will be a great experience to watch 1080p iTunes movies on such a device. But how? As we all know, any iTunes downloaded movies are protected by DRM protection, which prevents us playing iTunes purchased or rental movies on any other device except the one authorized. So the first thing we need to do is removing the iTunes DRM protection. NoteBurner M4V Converter Plus (For Mac & For Windows) is a top DRM M4V video converter for Windows users to remove DRM from iTunes purchased videos and convert iTunes M4V movies to Android devices like HTC smartphones, tablets, Samsung Galaxy S3, Galaxy Note 10.1, Google Nexus 7, Amazon Kindle Fire HD, etc. Here we will guide you how to use this DRM remover tool step-by-step. Preparation: Download NoteBurner 1080p iTunes M4V to HTC Converter. And please check if you are running the latest version of iTunes. Step 1. 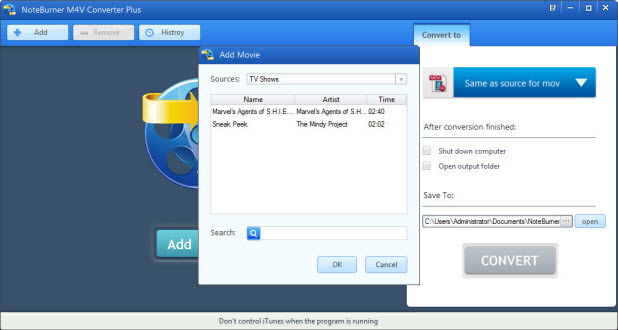 Import iTunes Movies to NoteBurner M4V Converter Plus for Windows. When you start the NoteBurner DRM M4V to HTC Converter, the iTunes will automatically run together with the program. Click add button and then choose M4V movies from iTunes library. Step 2. Choose output format for compatible with HTC One Max. To convert 1080p iTunes M4V movie for HTC One Max playing, you need choose Android compatible video formats like MP4, MOV, AVI, and etc. Here we recommend you click format menu and choose same as the source video (*.mp4) to keep the 1080p video quality in the output videos. HTC One Max can play 1080p videos well with a larger than 5 inch screen. Step 3. Click Convert Button to Start 1080P M4V to HTC One Max Conversion. Just click the convert button and start to convert iTunes M4V to HTC One Max. Leave the program and iTunes converting the movie. The conversion will be finished soon, please just leave the program and iTunes launched. Once it's finished, you can connect your HTC smartphone to the computer and transfer the converted 1080p mp4 video to HTC One Max.